I love making my family’s meal time special with home-cooked nutritional food. I believe spending time together around the table promotes a bonded family and makes each person feel important and valued. was releasing, I eagerly awaited my early copy of the book. Mary’s a Christian author who shares the same belief as I do and talks about it in her new book. 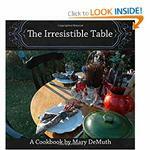 I’m excited to share with you one of her recipes. I know it was the first recipe I tried, but not the last. Sauté chicken breasts in a little olive oil until done. Cut into large chunks. 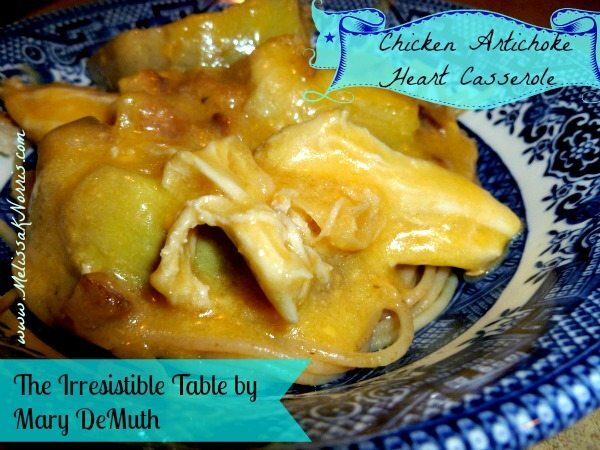 Layer chicken and artichokes in a 9×13 pan. Melt butter in medium sauce pan, add flour to create a roux. (For instructions on how to make a roux and sauce go here. )Add chicken broth and stir until thickened and combined. Add wine and cheddar and onions over low heat. Stir until melted. Pour sauce over casserole. Combine bread crumbs and Parmesan and sprinkle over casserole. Bake uncovered at 350 degrees for 25 minutes. Serve with rice or pasta. Sauté chicken breasts in a little olive oil until done. Cut into large chunks. Layer chicken and artichokes in a 9×13 pan. Melt butter in medium sauce pan, add flour to create a roux. Add chicken broth and stir until thickened and combined. Add wine and cheddar and onions over low heat. Stir until melted. Pour sauce over casserole. Combine bread crumbs and Parmesan and sprinkle over casserole. Bake uncovered at 350 degrees for 25 minutes. Serve with rice or pasta. What’s your favorite memory of eating together around the table? Did you have any traditions around the dinner table? Previous Post Processed Replacements-Make Your Own Cream Soup Substitution Next Post Does Your Self-Image Need Refined?